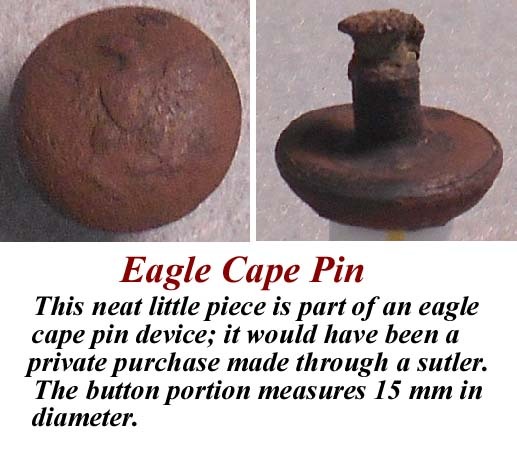 This neat little piece is part of an eagle cape pin device; it would have been a private purchase made through a sutler. 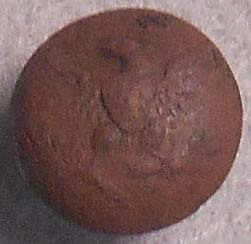 The button portion measures 15 mm in diameter. 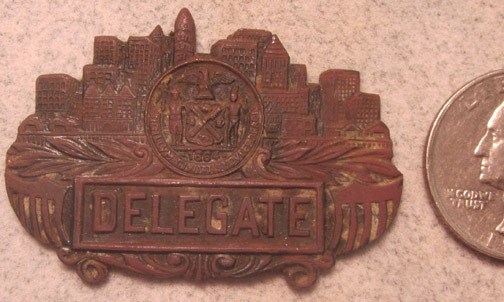 Delegate's Badge with the Seal of New York City. Dug in Culpeper County, Virginia. Not sure for which represenative body it was designed. The seal of the city of New York, adopted in an earlier form in 1686, bears the legend SIGILLUM CIVITATIS NOVI EBORACI which means simply "The Seal of the City of New York." 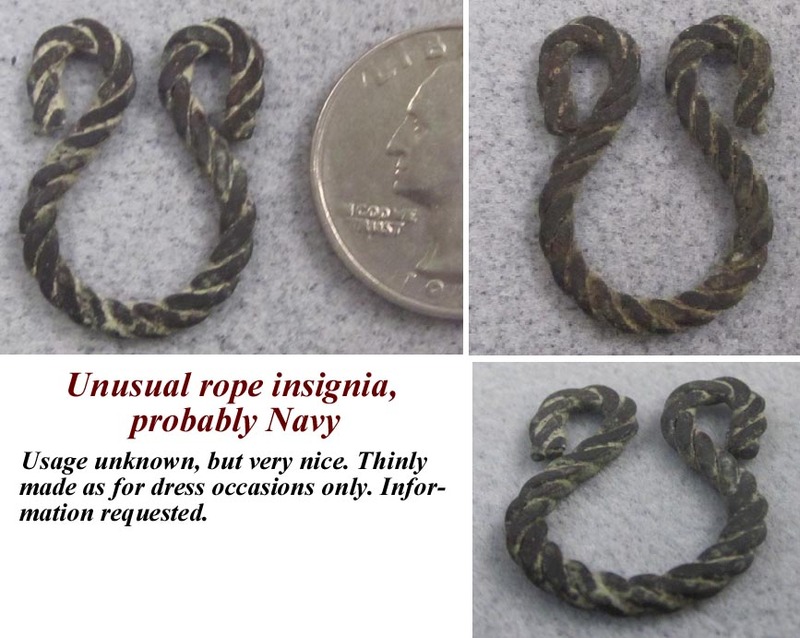 Unusual rope insignia, probably Navy. Usage unknown, but very nice. Thinly made as for dress occasions only. Information requested. Two U.S. Army Shooting Badges. 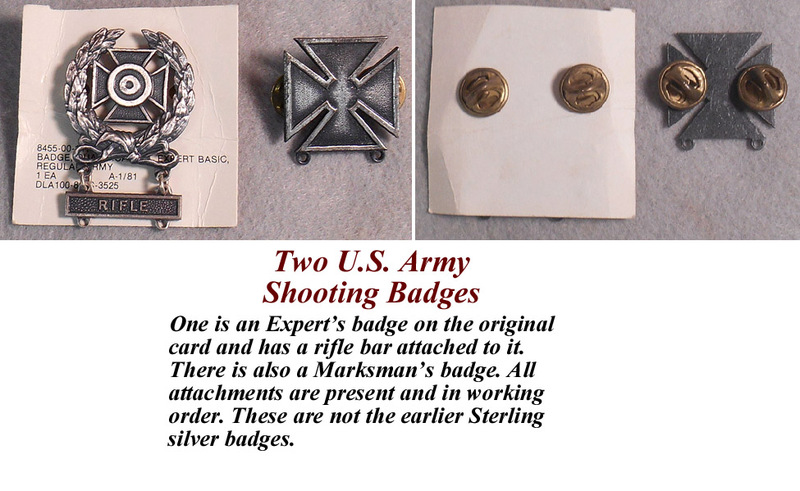 One is an Expert's badge on the original card and has a rifle bar attached to it. 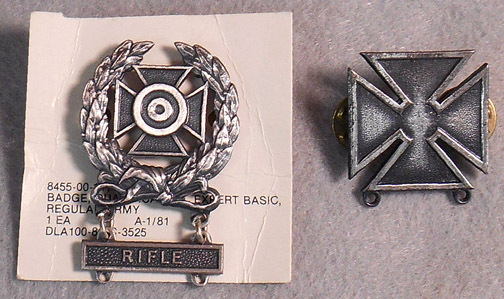 There is also a Marksman's badge. All attachments are present and in working order. These are not the earlier Sterling silver badges. 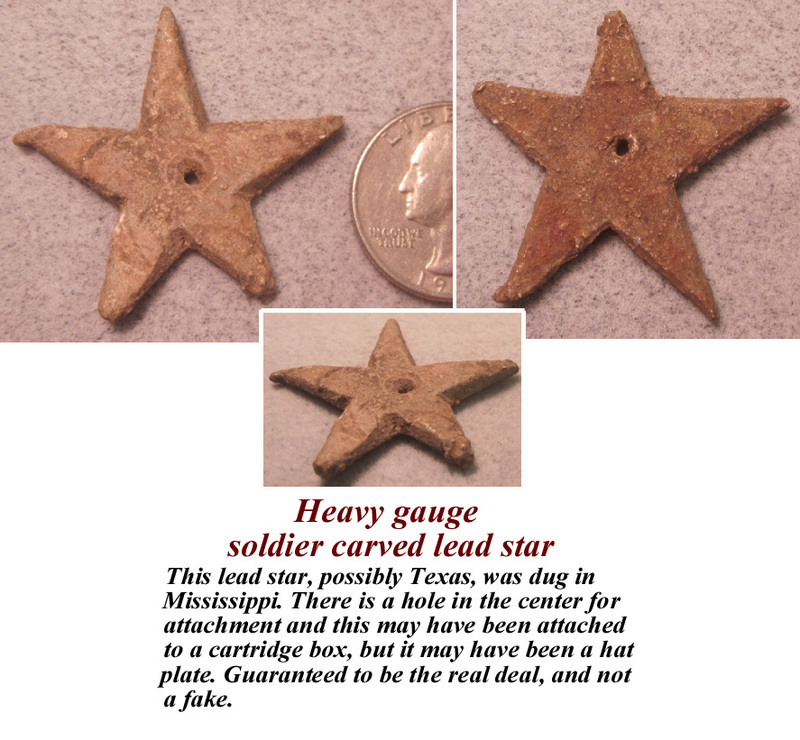 Heavy gauge soldier carved lead star. 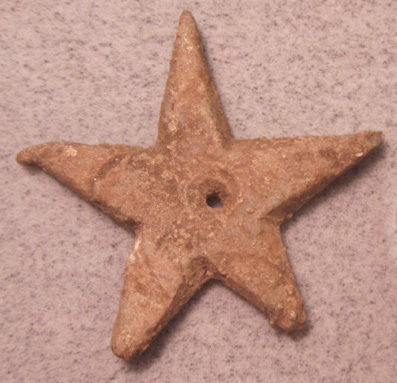 This lead star, possibly Texas, was dug in Mississippi. There is a hole in the center for attachment and this may have been attached to a cartridge box, but it may have been a hat plate. Guaranteed to be the real deal, and not a fake. U.S. 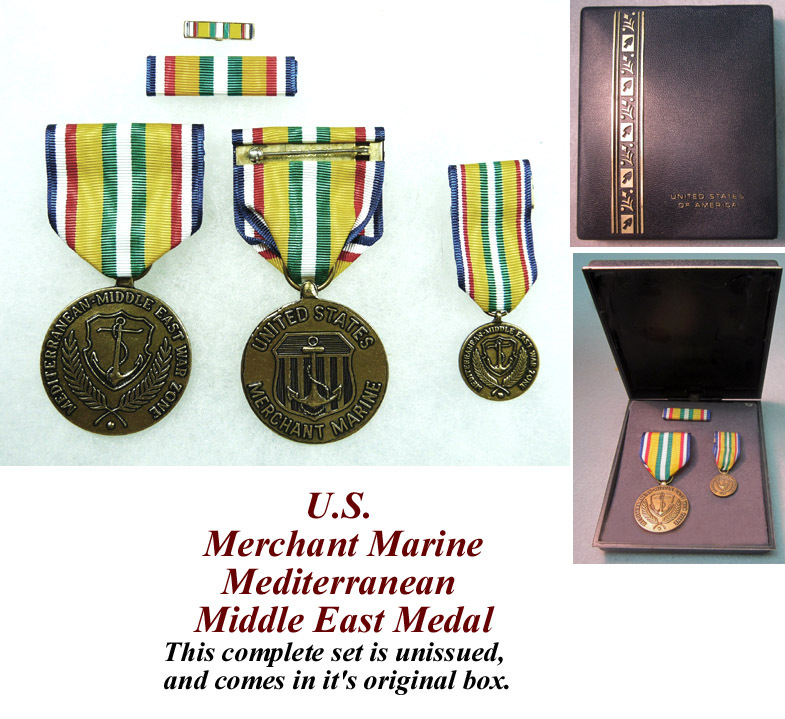 Merchant Marine Mediterranean Middle East Medal. 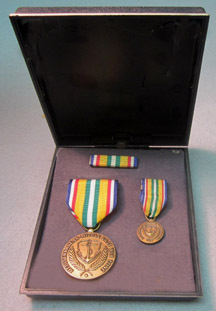 This complete set is unissued, and comes in it's original box. 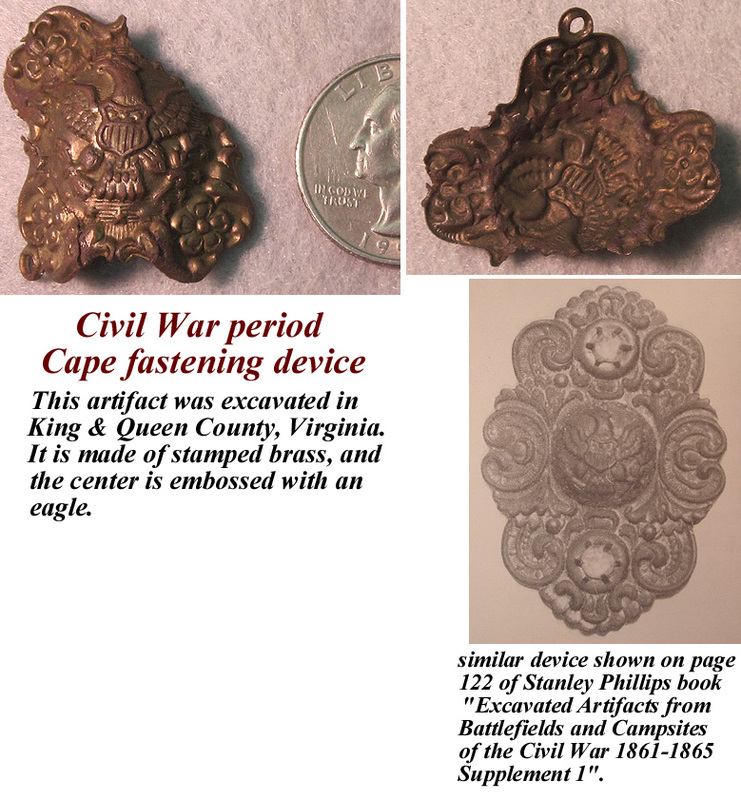 Civil War period Cape fastening device. This artifact was excavated in King & Queen County, Virginia. It is made of stamped brass, and the center is embossed with an eagle. A similar device is shown on page 122 of Stanley S. Phillips book "Excavated Artifacts from Battlefields and Campsites of the Civil War 1861-1865 Supplement 1". in a Sgt. Riker case. 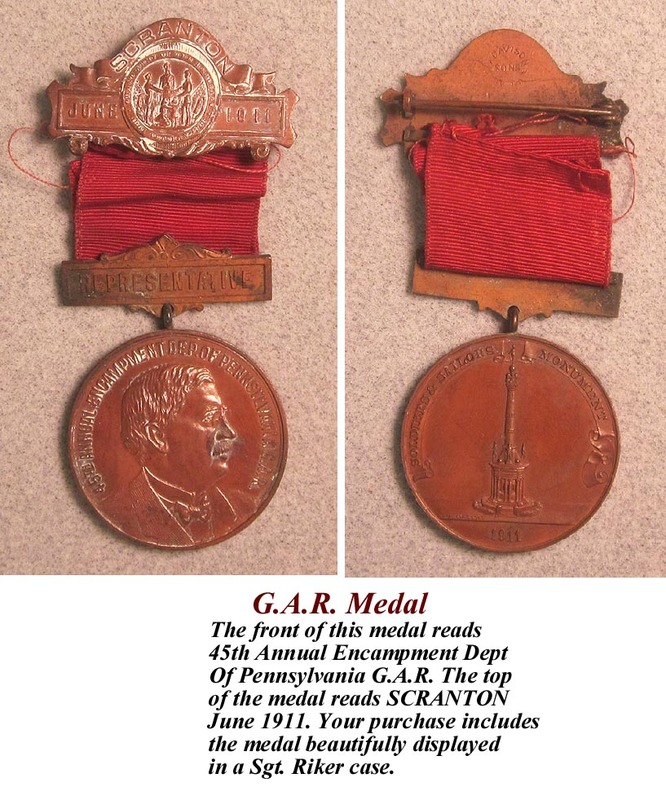 The medal has talc added to show better detail. 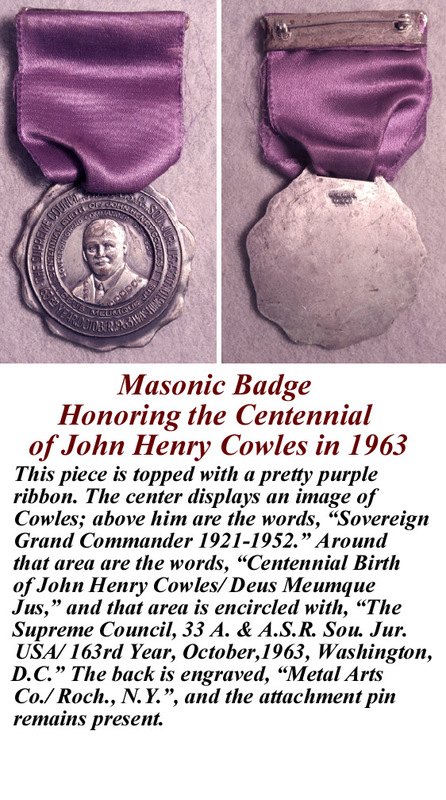 Masonic Badge Honoring the Centennial of John Henry Cowles in 1963. This piece is topped with a pretty purple ribbon. The center displays an image of Cowles; above him are the words, Sovereign Grand Commander 1921-1952. Around that area are the words, Centennial Birth of John Henry Cowles/ Deus Meumque Jus, and that area is encircled with, The Supreme Council, 33 A. & A.S.R. Sou. Jur. USA/ 163rd Year, October,1963, Washington, D.C. The back is engraved, Metal Arts Co./ Roch., N.Y., and the attachment pin is present. 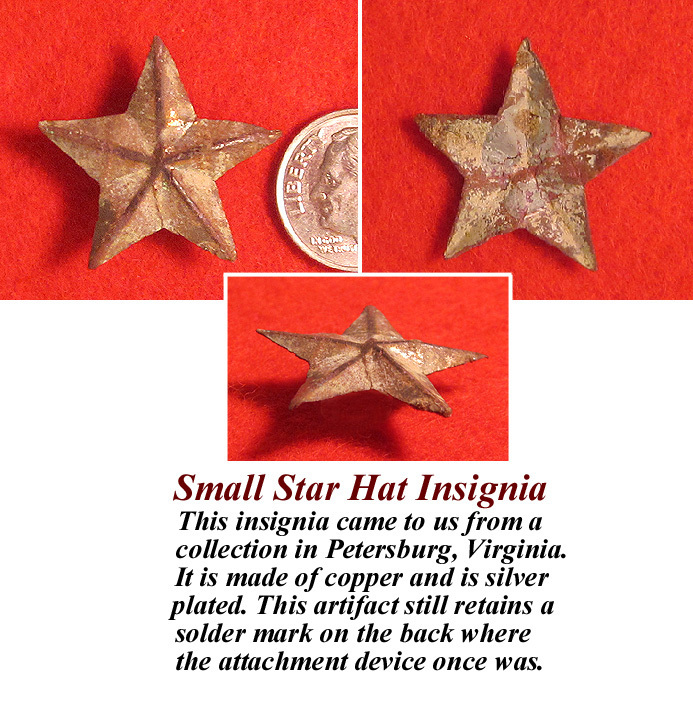 This insignia came to us from a collection in Petersburg, Virginia. It is made of copper, and is silver plated. This artifact still retains a solder mark on the back where the attachment device once was. This artifact is in excellent condition and has been examined by historian Mike O'Donnell and proclaimed original and complete. 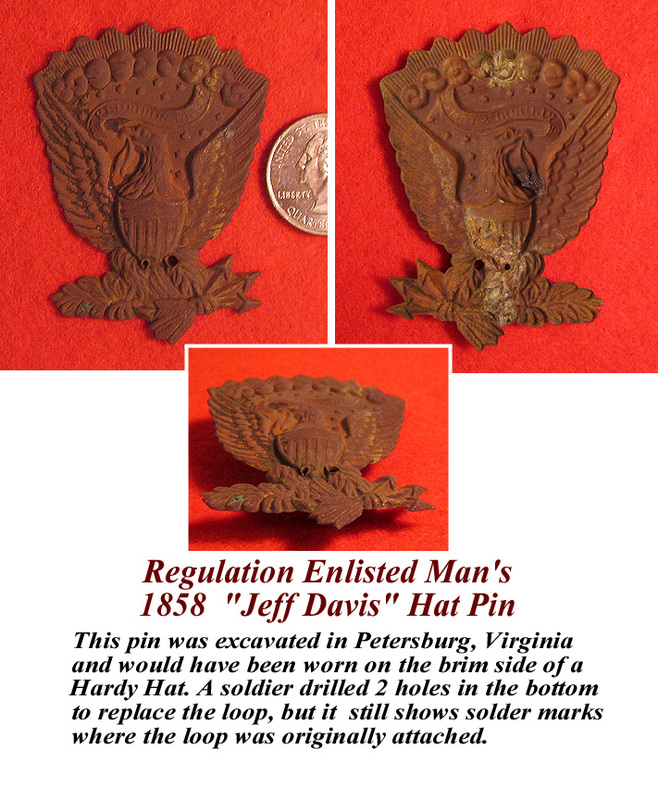 Regulation Enlisted Man's 1858 "Jeff Davis" Hat Pin. 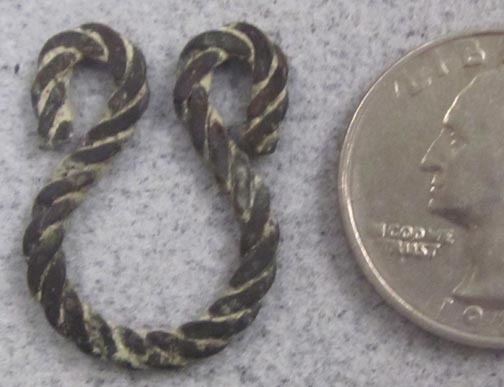 This pin was excavated in Petersburg, Virginia and would have been worn on the brim side of a Hardy Hat. A soldier drilled 2 holes in the bottom to replace the loop, but it still shows solder marks where the loop was originally attached. This artifact is in excellent condition and has been examined by historian Mike O'Donnell. John Wedderburn & Co. Patent Attorney Silver Medal, circa 1890. Apparently, John Wedderburn was a scoundrel who preyed on unsuspecting clients. This Sterling Silver presentation medallion is over layered with gold. The front is embossed: Presented by John Wedderburn & Co, Patent Attorneys, Washington, D.C., U. S. A. 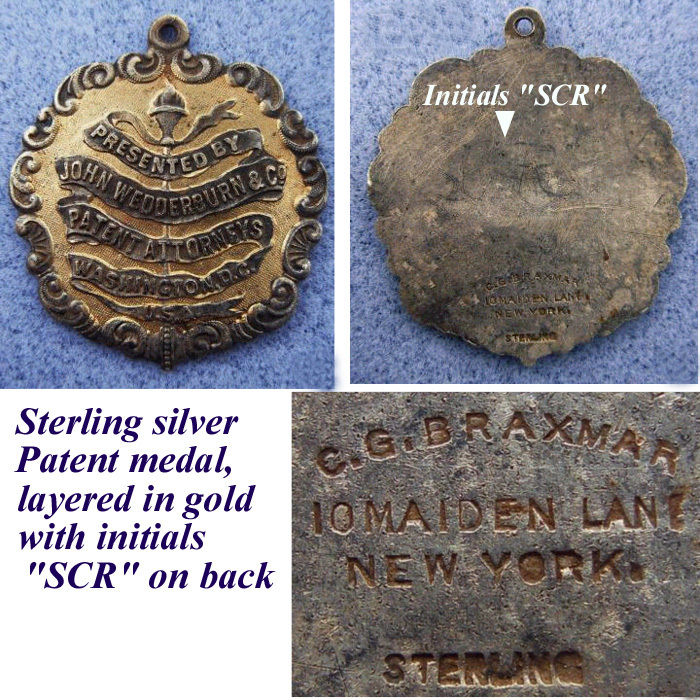 The back is marked Sterling, C. G. Braxmar, 10 Maiden Lane, New York. Initials that appear to be "SGR" have been superficially scratched into the silver on the back. (I would speculate this was to whom the medal was awarded.) I personally dug this piece about a mile from Beaverdam Station, Virginia in 2006. Comes in a handsome 3 x 4 x 3/4" Sgt. Riker case.